Well, let’s review a lil’ first, just to make sure the messages aren’t being lost. The “Letting go” faerie has shown herself three times, now… the first two times she was up-side-down, or inverted. Today, however, she came out upright. The first time I drew her, the Tarot that went with her from the Rider/Waite deck was the King of Cups. What I initially said in regard to king of cups was to work hard at keeping emotions in check, warding off depression or tendencies to focus on the negative, and to invest more energies into home, family, and work to help restore emotional balance. When I researched other sources, I added that this card could indicate being a healer, and could also project a male influence in regard to fatherly energy and/or proposals. Furthermore, this post provoked an interesting connection with fellow blogger, Dove Love, who shared not only her brilliant insights, but also her artwork in relation to this card, which she’s called King of Cups and Patterns. 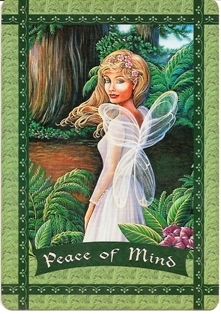 When I drew the “Letting Go” faerie again on the 19th, I very specifically stated, “Okay, I get it… ‘let go’… but HOW?? ?” That being asked, I drew the Tarot Card Five of Swords, a card that was also a repeat card, drawn previously on June 18th. The Five of Swords card warns against self-focus, all-about-me syndrome, and dishonesty or activities taking place outside the realms of morals and legality. In summary, then, I could say that the reason I’m holding on and refusing to let go, the reason I’m stuck in a rut is because I have a PATTERN of falling into DEPRESSION based on the fact that I SELF-FOCUS when pushed to the wall and challenged. When I face struggles, particularly with providing for my family, I slip into tunnel vision where all I can see is my own suffering (and that of my family). Thus the struggle begins to HOLD ON to the reigns and try to navigate our way out of it. That’s when I kick into “control” mode and try to dictate to the Universe how things are supposed to be, rather than trusting that the Universe knows more than I do and isn’t going to let me fall. 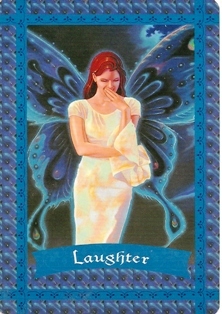 Well, today that Letting Go fairy came up again, but this time, instead of being up-side-down (screaming for my attention), she’s right-side-up, which means her message/meaning/mission are still in play – but that I’m making progress in applying that message to my life. I haven’t made it yet, but I’m well on the way. Which Tarot joins her today, then? Sweet! Welcome, welcome to the Six of Wands, UPRIGHT! VICTORY! When I see the six of wands, I see celebration. Mission Accomplished. Wands, the suit on this card, indicate new beginnings, new awareness, new insights, new possibilities, new perceptions. The person in this card set out on a mission, had a task to accomplish. In this card, we see that task as being complete, the returning with a wreath (crown) on his head, a confident stance on his horse, with the horse being decorated and looking equally as proud. This card is a congratulations. So while I’m not all the way there yet, I can rest assured that if I continue on the path I’m on, working at letting go of control, not trying to “force” solutions, trusting in the universe, and not falling prey to masochistic tendencies due to self-focus, I’ll come out of this challenge victoriously. 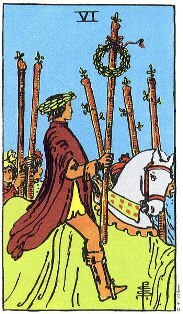 The Six of Wands is the minor arcana counterpart of the Chariot. Both of these cards represent moments of victory and triumph. Sometimes in life, all we want to do is win – to be number one. You can see this dream in the faces of athletes, politicians, and other champions as they step into the winner’s circle. It’s all been worthwhile. I’m the best. I’ve won! and when it changes quarter it changes name. The Victory Card: A victorious man on a horse, applauded by all, enters carrying a wand with a laurel wreath. Here is the conclusion to what happened with the Five of Wands. Competition was fierce, an answer had to be found to make the Querent stand out, make them different, special. Ah-HA! says the 6 of Wands. The Querent has found (or will find) that solution. Success, in fact, requires that they be above all others, that they make themselves a champion of the people. Note the give-and-take common to all 6’s. The crowd offers the victor applause. He, in turn, offers them a champion to adore. For this moment, both are happy, the victor with adulation, the crowd with their hero. And here’s the song that’s been singing itself to me over this past three days. Coincidence? I think not. The video quality is lacking a bit, but that’s irrelevant. I’ve been writing quite a bit about this lately, actually. I’ve been making internal adjustments in regard to my views on love, romance, commitment, partnership, marriage, and all that jibberish. I’ve decided it’s time for that dreamy little girl to grow up an get a good, solid, firm grasp on this so-called reality. It’s the daydreamer in me, that little girl who fantasized of Prince Charming and Happily Ever After that gets me into so much trouble. I’ve finally come to the conclusion that there is no Knight in Shining Armor… not in the way I’d once imagined, and that – in truth – I really don’t like the feeling of being swept off my feet and caught in that “airy-fairy” whirlwind of emotion. No… twitterpated is NOT where I want to be. I’d much rather stay grounded. But, I didn’t know that about myself when this new relationship sprouted, and it took a few hurt feelings for me to re-gain my balance and draw myself back in. Well, I wrote of being guarded and shielded, then re-writing those words because they sounded to “protective”, and it wasn’t a “defense” mechanism. Instead, I said I’m keeping my heart “reserved”, holding some back, investing my love in more substantial areas… where it belonged… with my children, my animals, my writing, my home, my Self. I wrote that I can appreciate what there is to appreciate in romance and this new relationship without over-exposing myself, over-investing, over-analyzing, or dissecting it to death. Take it down a notch. Enjoy what there is to enjoy without forming an emotional attachment. Here today, gone tomorrow… I’ll survive. I don’t “need” anyone to promise me their forever or make me their one and only (do I?). So I’m struggling with this issue, obviously. To love or not to love, that is the question. Nah, no it isn’t… that one I already know the answer to. I know how to love. I know how to love hard, deep, and completely (when I choose to). I guess the real question is: To be loved or not to be loved… now there’s the question. So I’d come to the realization that I am not meant to be anyone’s “one and only”. I will never be “the one” that someone has been searching for. I’ll always be “really cool” and “fun to hang out with” and “this close” to perfect… but not close enough to be “the one”. That’s what prompted the writing of “The Stepping Stone” the other day, the first piece I’ve written fresh in a really long time, and one that was written from the paradoxed position of pain and healing. And now that I’ve decided that I’ve gotten over myself and I’m cool with whatever, now I draw Romantic Partner? HA! No wonder the laughter card was a prelude to this (drawn earlier this week) telling me to find the humor in life. HA! HA! And frigging HA! Well, if this card came up in a reading for someone else, I’d tell them that they were either about to meet a new Romantic Partner, or that if they already had one, it was a keeper and one that deserved more of their attention and energy. Of course, that interpretation might vary a tad depending on which other cards it came up with. When I do full spread readings for others, I use two decks together… the Rider/Waite deck which I read first, and then I lay the fairy Oracles on top of them so they’re synchronized. Nonetheless, the Romantic Partner is the focus here and is asking for attention. How ’bout if I just shut up at this point and list what the book says. I’m obviously tripping over my own feet (tongue) with this one. Card Meaning: A new romance is coming your way! Either a new partner, or a revival of passion in an existing relationship will delight you now or in the future. 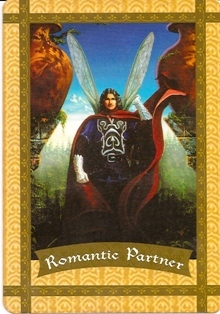 Description: By drawing this card, the fairy realm wants you to know that a new wave of romance is coming your way. Romance could manifest itself in a number of delightful forms, such as meeting a new partner who makes your heart sing with excitement and passion, or a rejuvenation of a waning romance with a current love. Perhaps the new romance will take the form of an exciting getaway, such as a tropical vacation, a night at a quaint bed-and-breakfast Inn, or an evening of dinner and dancing. Affirmation: I am a romantic person. I release any fears I may have about giving or receiving love.